About two months ago, I was provided by John Law with a first set of 2 x 2 images from a prototype of the lens. The 360 degrees scene was covered by two opposite hemispheres and a second redundant set was shot at 90 degree in yaw from the first. I have been impressed by the optical quality but I could not conclude until using images from the final production batch of the lens. I had observed a problem on the images of the prototype. This was confirmed on images from other pre-production lenses. As I believed that this could be possibly corrected I had refrained from concluding too early. I have again been provided by John Law with two sets of photographs of the final production batch and can now write a report. From experimenting with about 15-20 different sets of superfisheye images, the most remarkable feature of this fisheye is the Angle of View that is got even on an APS-C DSLR. At about 185 degrees that confirms the claim by Sunex in its specification. 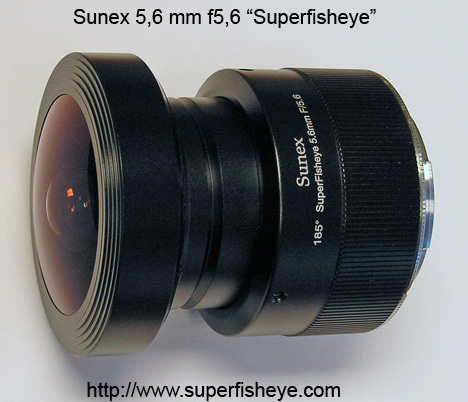 I shall now make a simple list of remarks concerning the stitching of Sunex superfisheye images. It shall relate mostly but not exclusively to PTGuiPro/PanoTools. 1) Unlike Canon, the Nikon user benefits from the Nikon mount generic properties and the stitching software can therefore use the EXIF camera provided information. Unfortunately the superfisheye focal length is there reported as being 6 mm (rounded from actual ~5.6 mm due two lack of bits in the data). 2) As a consequence of the precedent point, the crop circle that is auto-determined by PTGui is way too large and requires a large manual adjustment of the crop circle. I had some discussion with Joost about that point. Other software do (most of the time) better, probably by using an other method than simple radius computation. 3) The blue shaded limit of the circular image of the Sunex fisheye is often rather "fuzzy". Accurate manual cropping is consequently difficult. The sure way to overcome this is to sacrifice some FOV margin by cropping more of the apparent circle. 4) I have observed that internal light scattering in the lens builds very often some highlighted large parasitic rings around the useful source image. These rings can be incompletely annular. As manual circular cropping is anyhow required when using PTGui (see above) this should not matter, but I have been sometimes challenged to find visually which is really the actual circle limit of the useful image. This is the problem that had held me from publishing an interim report earlier. That makes all the stitching software on par because of this troubled automatism, as manual operation is required for all at least for initial calibration. Careful lens calibration for stitching is recommended and template usage almost mandatory for proficient workflow. This is not usually well understood by the typical casual users or by the beginner. 5) I cannot explain why the PTGui Project Assistant gets sometimes trapped into erratic optimization specifically with some of the sets of 3 images but not systematically though. To be investigated further. 6) PTGui cannot handle the double-shot Sunex superfisheye images other than when full manually controlled by the user whereas two other commercial software can, but I have also observed some failure with them that had to be corrected manually (see above). An other one just can't cope at all with that case apparently. 7) Vignetting is moderate with the Sunex fisheye. But it has to be fully and perfectly well corrected before stitching especially in the double-shot case: a darker linear transition would be otherwise often very visible at the seam between the two hemispheres. 8) The radial mapping of the Sunex fisheye seems to be well accepted by Panotools and PTGui algorithms. It is less so by other two commercial software. The same third one as before just appears to not be able to cope with these fisheye properties. I am rather inexperienced with it and this may also play a role. 9) Sharpness is generally adequate and good especially on the core part of the image. But in some occasions depending on the subject, the output panorama looks very soft and lacking of contrast along and near the single seam in the double-shot case. It is also and always so in the three-shot case both in the nadir and zenith regions. It may be barely acceptable in some architectural critical cases. Supplementary shots would then be required. The lower resolution of the image due to the unusually small focal length intensifies this inherent weakness. 10) Lateral color (aka Transverse Color Aberration) is quite high but it is very easily and quite fully correctible. 11) Due to different concurring reasons additionally to the precedently reported, total failures to successively stitch double-shot images with two dedicated commercial software have been noted on a first try in automatic mode. Manual control allowed to get better, if not perfect, result in every case. With three-shots, the success rate is dramatically increased. I have been experimenting with Sunex superfisheyes for approximately two months now and then. I had suspended my appreciation by waiting for the finalized production model. I was eager to see what this lens would produce as a unique double-shot device to make panoramas from DSLR images. The first initial strategy was clear to me and implicitly simple to understand IMHO: thanks to more than 180 degree of angle of view, just supplant the comparable but very expensive Coastal Optical (aka IPIX) fisheye for double-shot "à la IPIX". Ironically, this fisheye can be used in double-shot mode with non-Sunex panohead anyway. I assume that the quality standard has raised to a much higher level since the IPIX era and that this cannot been reached with a double-shot method on a systematic and repeatable manner. With only the "three positions" rotator presently made available, Sunex shall have to compete with much better, numerous and cheaper performers that can be used the same way. The unique advantage of simultaneous 185 deg Angle of View and full un-cropped circular fisheye image, is lost. The Sigma 8-mm on an APS-C DSLR, the same Sigma 8-mm or the "shaved" Nikkor 10.5-mm or Tokina10-17 or Sigma 10-mm (if they were "shaved"), when fitted on correspondingly FF cameras (without adapter) are probably preferable in every sens since they offer better sharpness and greater output resolution. Adding the Sigma 4.5-mm to this list, all of them will give full EXIF data transmission as well as aperture/focus full manual or automatic control. Of course the cost of these combos shall vary and this may count for a fair comparison. While it is definitely a good lens, I believe that the Sunex superfisheye comes probably a little too late to be an absolute winner. I might use it, but not for more than two shots to produce an acceptable 360 x 180 panography, knowing now from experience that technical care and experience is unfortunately required to do so.